As I came to understand in my 65th Year posts, I am very lucky. I have been able to work in the arts pretty much on my own terms. However there are disadvantages to being a solo act and for me, the biggest one is that there is no one to promote my work but myself. I really do enjoy reaching out to people and sharing my work in a general way, but have a tough time when it comes to a more specific approach, like saying, I made this. How about you buy it? Texture and context collide in Gaylord's absorbing retrospective of collage. Consider this a chapbook-sized coffee table book of art-books or book-collages. Photographed within its pages are collages—constructed from various artisanal paper and natural material—that loosely resemble books in structure and meditative thought in concept. And like the mind, the thoughts continue. The numbered pieces are sometimes salvaged to create entries further in the line. The artwork is captivating even in this smaller format. In both a physical and conceptual way, the book harkens the smaller reproductions of Matisse's Jazz, yet with the variegated range of Gaylord's earthen, natural palette. If you live north of Boston, you can purchase copies at the Jabberwocky Bookshop in my hometown of Newburyport, MA. I'll be there on Friday, December 4 with a mini exhibit of original Spirit Books during Newburyport's Invitation Night from 7–9 PM. 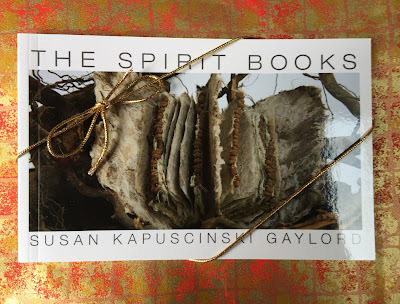 The Spirit Books catalog is also available on amazon. You can order copies here. I haven't figured out a way for you to let me know if you would like it signed and/or inscribed through amazon. Feel free to send me an email—susan (at) susangaylord.com—after you make your purchase with your request.